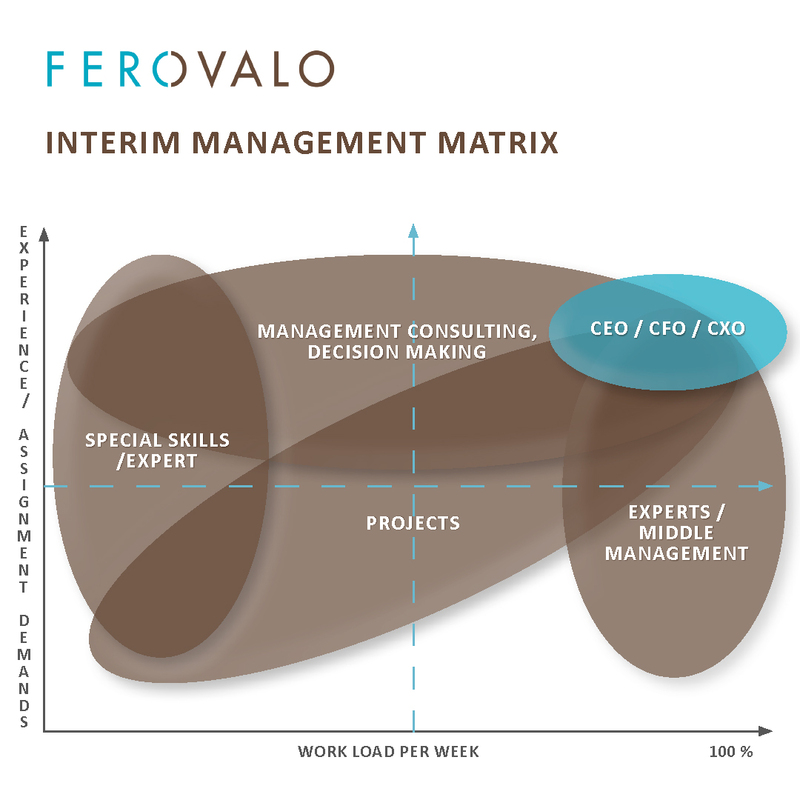 At Ferovalo, we believe that a company's success is based on the competence of its management and experts. We think that an Interim Manager is an Executive in the purest sense of the word. They bring Operational Competence to where it is needed. They are a precision instrument or a powerful tool to fix specific issues. Interim Managers/Operational Competences are not consultants but movers and shakers. They bring about changes, boost productivity and skills in an organization’s change situation and raise the competence level of organizations. One of the key factors to a company’s success is a competent board. This is why we have launched our Competent Board service. We help you find the best possible candidates from a broad field of competent candidates. Our mission is to make your company succeed. If you have Interim Management need you can send us Assignment Info, and we will contact with you. To fill this info we will not automatically publish it to our members but always contact with you first. When a key person is leaving a stand-in, manager is needed to fulfill the role or render additional substance to the role as needed. An Interim Manager can be either a part or full-time resource. An experienced professional is a guarantee that a job will be done well. The interim managers are highly qualified and are experienced doing similar work many times before. We at Ferovalo have a database of 400+ people. We have the best talents for your most crucial roles. Sometimes your company finds itself in an unexpected situation. There may be a sudden change in the business environment or changes have not been fully appreciated and there is a need for a quick turnaround. In such situations a turnaround manager may be needed to make the necessary changes. This kind of situation is often best handled by an interim manager. Having a clear plan and strategy is important, but having the right people in the right places is critical. As organizations face growing pressures to be more innovative and efficient and business models continue to evolve, they see great benefit in sourcing individuals and teams who have helped other businesses in similar situations, so that they can leverage their transformation experience. Interim managers can make significant changes before it reaches a steady state and is ready for permanent recruits. A very senior and experienced person can bring about significant changes without disrupting the culture or structure of their organization. For example, an interim manager in the startup scene will complete a specific piece of work with no equity requirement. There are also situations when it would be unnecessary a make a permanent appointment for example, where a role will not actually exist in 1-2 years’ time. During a rapid growth phase specific and different competences are needed that may not be internally available. Instead of hiring, an interim manager is a more flexible alternative. A wide range of experience and competence is needed to manage growth successfully. In hiring an interim manager you can get someone who is overqualified but far more effective. This competence can be used part time, to leverage the strategy and actions needed to grow your company. When your organization takes on a new challenge or you need to do something novel an interim manager can be a valuable asset. In these situations, it is often difficult to find the right competencies internally. Taking aboard an interim manager with previous experience of similar challenges, ensures that you reach the goals set out for your project. Any project that is one-of-a-kind or transitional, benefits from an experienced outsider’s steady hand at the helm. These kinds of situations are for example mergers and acquisitions, IT projects, legal issues requiring organizational changes. We have an extensive database of independent consultants willing to take on assignments from our customers. When we have an assignment, we will inform all our members of this need. Our members who are motivated and interested will apply through our system. They will provide their CVs tailored specifically for this assignment. They will be required to provide references relevant to the position. Ferovalo presents candidates interested in the customer’s assignment. The customer then chooses suitable candidates for an interview. The timetable of the process depends on requested competence and the customer’s timetable, typically from a single day to a week. After a candidate is selected, Ferovalo will handle all contract administration. Contract parties are Ferovalo and the customer and Ferovalo and the candidate’s company. When an assignment starts Ferovalo will invoice the customer monthly, based on the agreed cost structure. The candidates will then invoice Ferovalo. The quality of our service and confidence of our customers and Ferovalo members is the cornerstone of our business. An Interim Manager can be brought in to improve recruitment processes. Depending on the size of companies there is a difference how competence is acquired and retained, channels, techniques etc. A state of the art plan drawn up a few years ago can be obsolete in a new environment. An outside view of the situation, free of any alliances or legacy can be an asset when implementing sensitive plans or inventing new incentive schemes. Developing these kinds of systems means always extra effort and thus the need for resources. If a crisis hits it will take the full effort of the full top management and communications. This situation can be eased by an experienced right hand person to handle the day to day crisis management. A product launch or other project that takes up all the effort of the marcomms team. And extra pair of hands can manage the situation hands on and relieve the strain on your team. SMB’s that do not have a dedicated communications team but need it from time to time, can use an Interim Manager in strategic communications and marketing efforts to get results and things done quickly and efficiently. When your team needs a fresh, new kind of thinking to kickstart your re-branding, product launches, new marketing initiatives, digital marketing or social media, an Interim Manager can bring that altered perspective to get things going. Any overhaul of your organization, goals or marketing tools benefits from a fresh perspective on things and out-of-the-box thinking. An outsider can bring in new ideas and practices. An interim Marketing Executive is free of the normal constraints of corporate culture. Growth needs extra resources. Managing customers experience can also require an outside perspective. Building a new market needs more sales. Getting new initiatives rolling requires new kinds of expertise and more resources than you may have readily available from within your organization. Building a new market is always a project where broader and deeper experience may be needed. Fresh customer insight needs data and novel ideas. Get help, get the tools you need, get an Interim Manager. CFOs are becoming more and more future oriented. To be able to forecast and anticipate future efficiently, you need a resource to bolster your present team. Finance and IT are often intertwined and can be outside the scope of more traditional CFO’s. IPO’s and new investors or other financial transactions often need an impartial professional to support the existing team. International growth brings new challenges to your financial department. Mergers and Acquisitions need always an extra focus and dedicated resources in the organization. IT is the traditional domain of Interim Managers and experts. Rolling out news systems or applications need expertise not readily available. It can also be a pre-procurement assignment, advising the organization in purchasing and tendering. An Interim Manager is not a consultant but a dedicated member of your team and takes part in decision-making. Digitalization affects the whole organization. An outsider with a clear understanding of the concept and the aims without prior ties to the organization can tackle this process more efficiently. WHAT OUR CUSTOMERS AND MEMBERS ARE SAYING? "I had met Elina for the first time just a few weeks before I received the first really interesting assignment description from Ferovalo. I applied for the assignment and was soon invited to meet with the assignor. We found each other immediately and entered into contract negotiations with Ferovalo. Within a few iterations we had signed and the assignment started immediately. During the assignment we had contact a few times with Elina, and she also helped in extending the assignment term as was desired by the assignor. Ferovalo works in an exceptionally transparent and smooth manner, which I appreciate a lot."